Chances are that any off-road enthusiast recognizes the unique eight-wheeled profile of the new Argo Aurora 800 Limited. The name Argo may not roll off of your tongue—yet. Argo isn’t currently a household OHV name, but it could become one. 2017 was the 50-year anniversary for Argo, and the milestone coordinated with an infusion of leadership making the move from Arctic Cat. 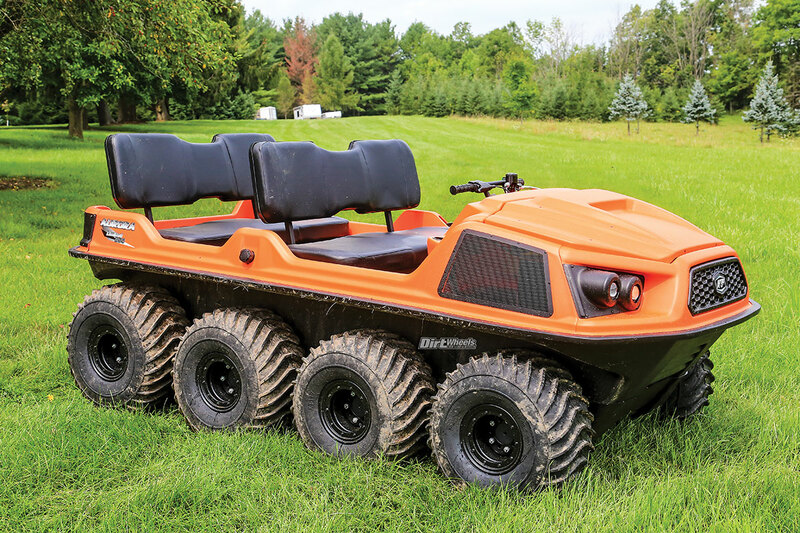 Using the anniversary as a kick-off, Argo made a huge push with its classic amphibious six- and eight-wheelers and added 4×4 quads. The results were a sales increase of over 50 percent in a single year. That must have motivated management, and the Aurora is a new amphibious platform that seeks to refine and modernize the basic Argo vehicle concept while holding true to the basics of the company. 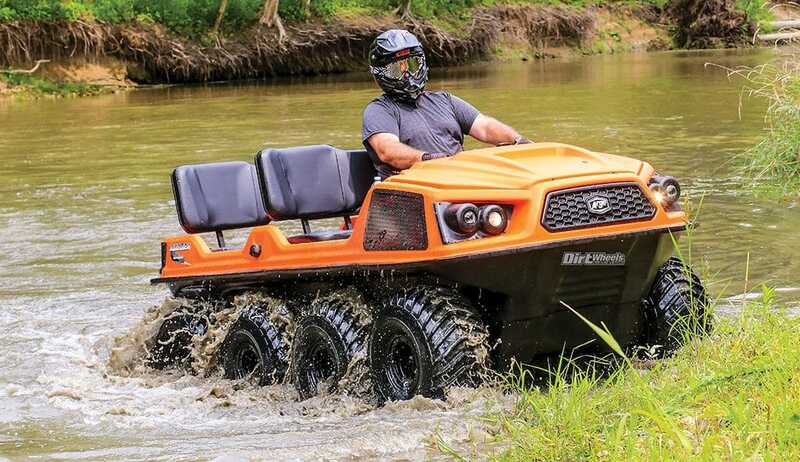 There are many vehicles that take the name “all-terrain vehicle,” but Argo could make the case that its amphibious models are the only machines that are truly all-terrain. You literally negotiate sand, mud, rock and snow, and drive right into and across or even navigate open water. That is all-terrain. We had trouble breaking ourselves of keeping a finger on the brake lever. That was how we discovered that hitting the brake does exactly nothing when the machine is floating. That is where the APS comes in. Much of the tech on Argo XTVs is basic, and while it is effective and ingenious, APS is basic tech. Springs, no doubt carefully selected and tested but still just springs, are mounted between the steering and each separate master cylinder. The arrangement is surprisingly effective. Unless you use exceptional delicacy with your steering input, a classic Argo steers in a series of small jerks to the side. 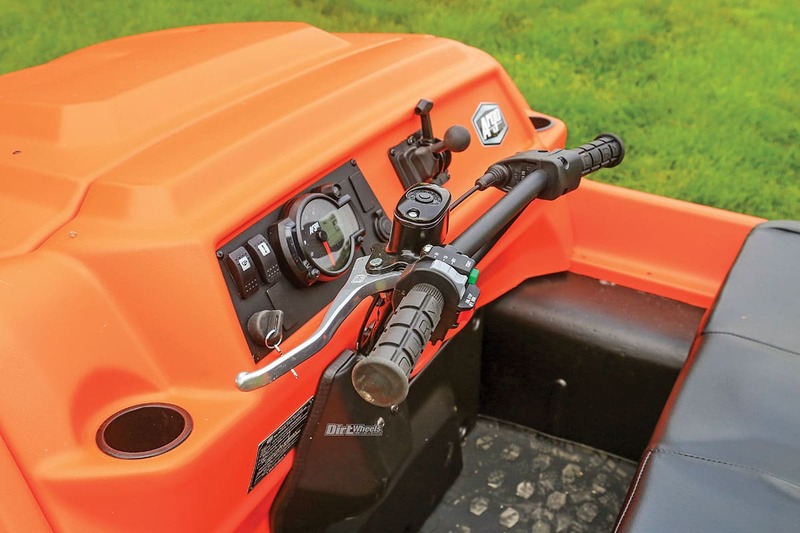 With APS, the steering is much closer to the feel of a normal UTV. Continuing the small and basic tech improvements are wheels and tires. All of the suspension comes from the tire sidewalls. Beadlock rims (steel or aluminum depending on the model and trim level) allow safely running a lower air pressure. Lower pressure equals a superior ride over choppy terrain. There is plenty of instrumentation, and the controls are easy to understand and operate. Having the shifter on the dash is an Aurora improvement. One of Argo’s goals is to make XTV machinery that feels more “normal” to customers accustomed to autos, 4×4 vehicles or UTVs. The Aurora is currently the only XTV in the line with the steering on the left. We assume that the right-side steering taps into the water side of the Argo. Each Argo amphibious model has a tough, high-density polyethylene (HDPE) all-terrain body shaped for buoyancy in the water. The bodies can withstand temperatures ranging from -40 degrees to 104 degrees Fahrenheit. One of the improvements for the Aurora is an engine compartment with heat insulation and sound-reducing accoutrements. Engines are from Briggs & Stratton or Kohler. For the Aurora, a new body was in order with a higher level of fit and finish and an automotive-style latching hood. The body parts are vacuum-formed in the plant from flat sheets of plastic. Aurora models have a new interior design with a more open foot-well, integrated anti-slip mats and over 20 percent more room in the cockpit. Those changes also ease entry and egress from the machine. New front and rear bench seats are more comfortable. Additional and welcome comfort comes from efforts to reduce sound and engine heat inside the cockpit. Tracks mount over the wheels, and the $4000-ish option is so popular that the factory has a guy working full-time making them. For extended water work, the outboard would be amazing. Argo uses a dedicated tire with closely spaced small paddles that dig through snow and mud, as well as provide forward motion in the water while the Aurora acts as a boat. For 2019, a single additional paddle was added, which spaced all of the paddles slightly closer. We didn’t have anything to compare, but Argo claimed the difference in ride, sound and traction was impressive. The low-pressure tires act as the suspension, drive on land and propulsion in the water. The tires mount on steel rims for the base model, steel beadlock rims for higher trim models and aluminum beadlock rims for the Limited. Naturally, the tires assist the buoyant body in flotation. On some Argo models there are different passenger capacities for land and water, but for the eight-wheel Aurora, four passengers are allowed regardless of the surface. A total of five Argo Aurora models are offered. They don’t vary in accommodations but do in accessories. The base 800 has non-beadlock steel wheels, while the 800 SX, 800 SX Huntmaster, 800 Limited and 950 SX all have beadlock rims, and the Limited’s rims are cast-aluminum beadlocks. When we tested the Aurora it was brand new and most likely considered a pre-production machine. The stickers said “limited,” but a limited should have aluminum wheels, a winch and a front brush guard, but ours did not. It looked like a standard 800 but had beadlock wheels. Prices for the Aurora range from $23,999 for the base 800 to $27,499 for the 800 SX Huntmaster or the 40-horsepower 950 SX. This is the exhaust setup. Every once in a while we would catch a sniff of exhaust while piloting the machine in the water or while moving slowly on land. Argo had woodland property for us to get a thorough test of the Aurora. It featured short but steep climbs and descents, grass, some rocks, roots, and water. And, of course, where there is water there is mud. It seemed like half of the test loop was in water. For a good part we were driving in water with at least some of the tires touching the bottom. For a good portion of the water the Aurora was acting as a boat. Argo has a standard torque transmission and a high-torque transmission. With the high-torque option the top speed is 17 mph on land, so our machine must have had the standard torque model. It was capable of 20 mph on dirt. That may not sound like a lot, but it felt plenty quick with the suspension capability that the tires offered. 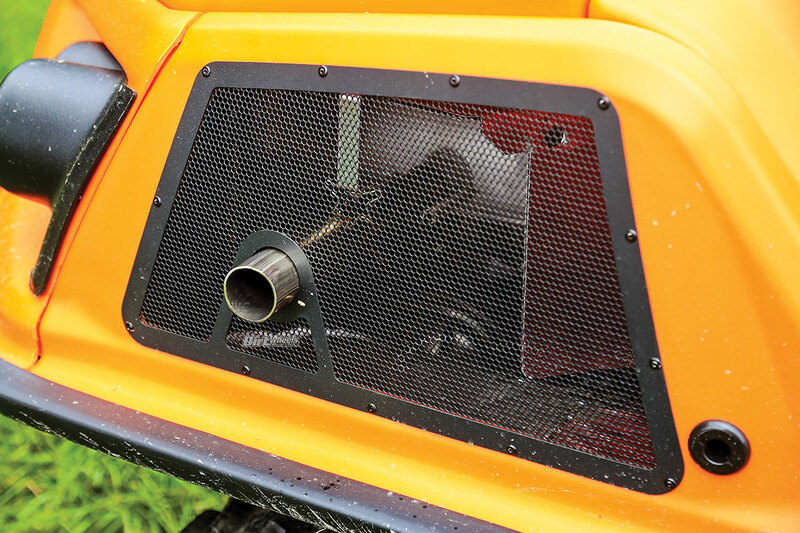 In addition, skid-steer machinery is not happy at speeds. 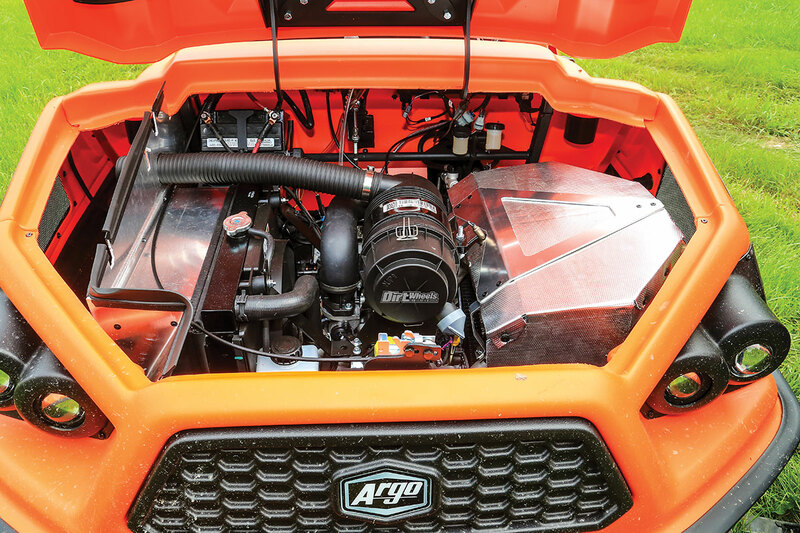 For the Argo, more than other off-highway machines, finding the right job for the tool is critical. Once you hit the water with the wheels acting as propulsion, top speed is 3 mph. It is best suited to still or calm water with mild currents. Do the math: 3-mph drive against a 5-knot current? We wouldn’t be looking for waves, either. 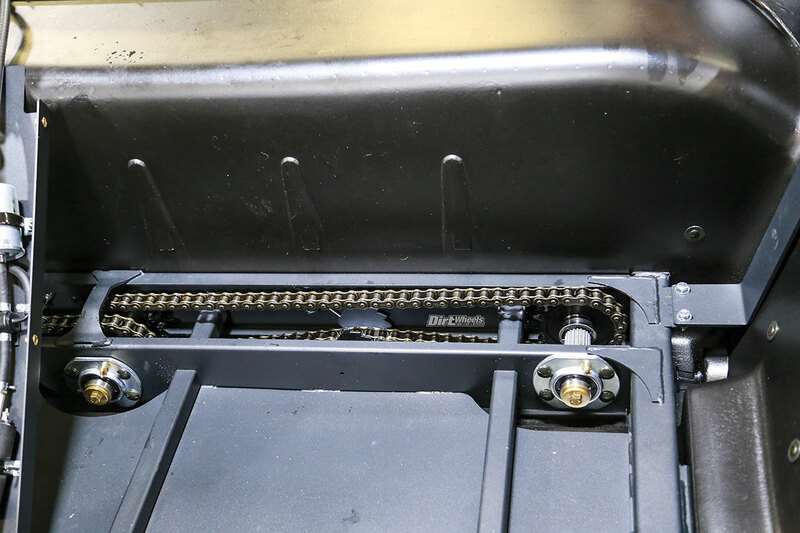 There is storage behind the rear seat, and the back edge of the machine is designed to mount an outboard engine. We have to think that would vastly increase speed and maneuverability in the water. Each of the eight wheels is mounted to the frame with a stub axle. More expensive models like the Aurora have extended bearing support for a more robust drivetrain. Chains drive the wheels. As long as we kept speed and enthusiasm in check, getting used to piloting the Aurora on land was actually pretty easy. We adjusted quickly but saw others who never truly seemed to come to grips with the skid-steer properties. In the water it was totally comfortable when the wheels were touching. As soon as the machine was floating, we soon realized that even the mild current was significant. Steering with the handlebar merely slows or stops the wheels on one side. That slows the machine but doesn’t do much for steering. We soon were bouncing along the bank unable to maneuver to the center of the waterway. It became obvious that leaning in the cockpit was a far more effective way to direct the machine in water. If you are alone in the machine, slide to the middle of the seat for best results. Once you get the hang of it, motoring around in the water is big fun. For UTV drivers, the lack of a roll cage is interesting. Lap belts are the only seat belts, and you are supposed to unlatch them when you hit water, and in Canada at least, helmets are optional in the water as well. We chose to remain helmeted but did unbelt for safety in the water. 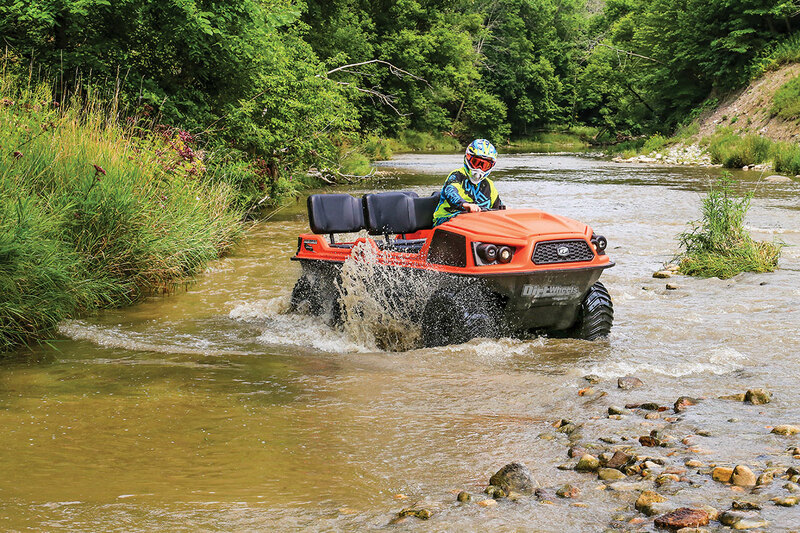 Water that might make you nervous in a normal UTV requires no thought at all in the Argo Aurora. The transition from boating to rolling on the bottom is smooth and easy. In terms of our usual measures of performance, the Aurora is certainly mild. It doesn’t love the rough at speed, either, and it is fun in the water but offers even less speed there. But that isn’t how you judge a machine like this. 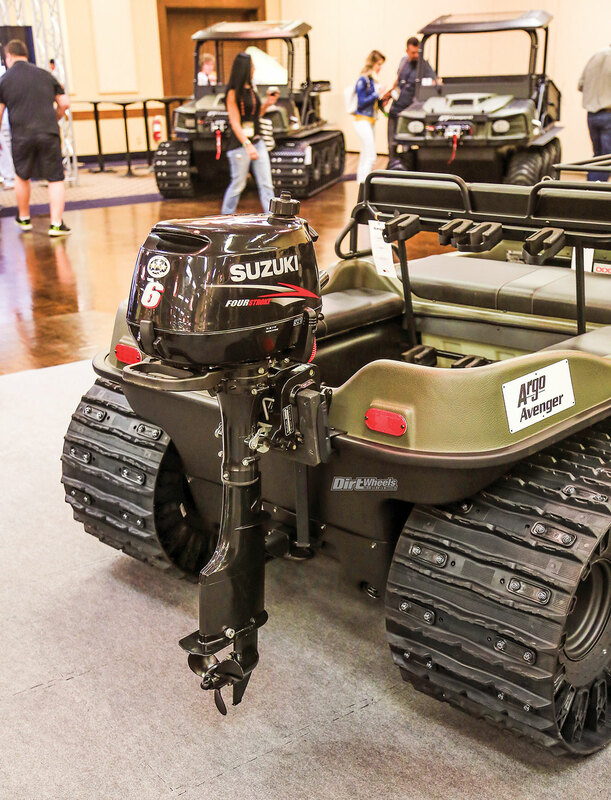 Many of the folks at the press launch are committed to hunting and fishing, and they were thrilled and in love with the capabilities that an amphibious machine offers. We could easily tow or carry a boat on the cage of a traditional UTV, but what do you do when you get across the water and your land machine is on the other side? 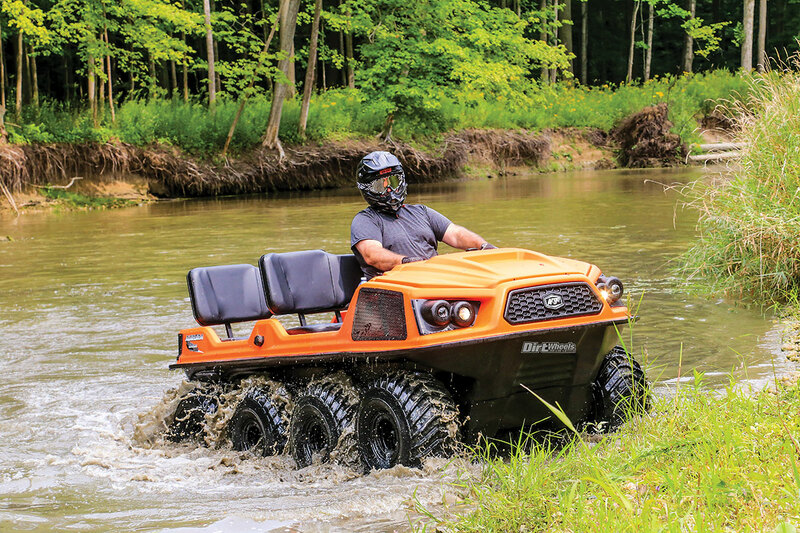 Argo has the answer, and if an amphibious machine is what you need, you know it and need no convincing from us. 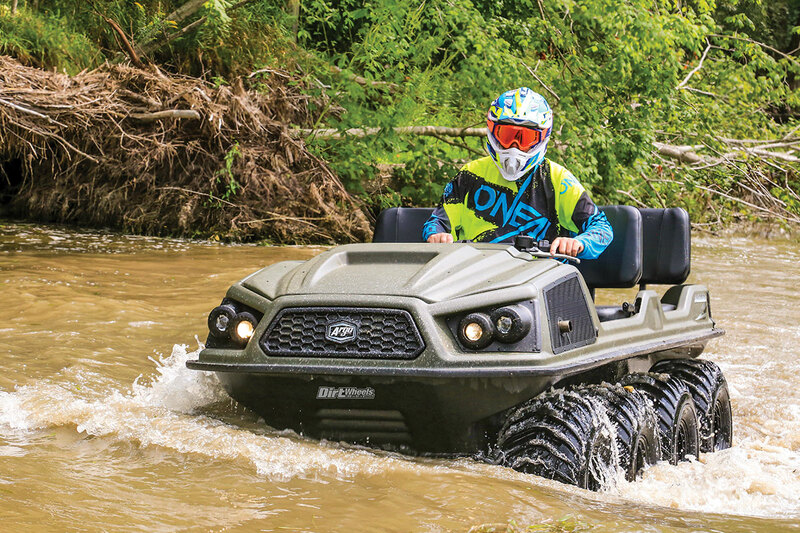 While the Argo Aurora 800 is roughly the same size as a UTV, it is a very different driving experience on land and truly strange but interesting and fun in the water.